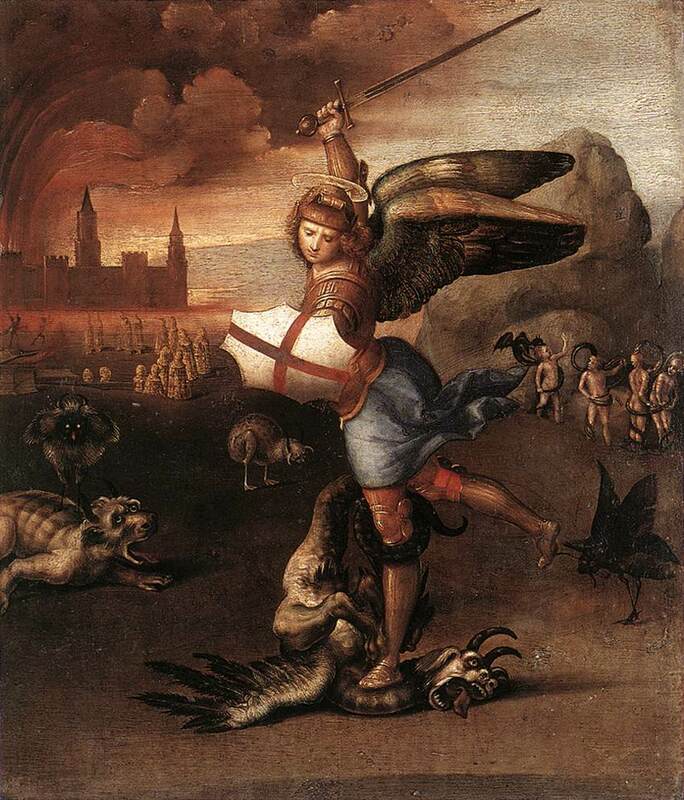 Today is Michaelmas, or, more formally, the Feast of St Michael and All Angels. In times past it was a very important day in the calendar marking the beginning of autumn (in the northern hemisphere), the end of the summer harvests, and, therefore a time for reckoning up – farm laborers got paid, as did rents. There were usually big fairs and festivals marking the turn of the season and the year. Thus, the date, although ecclesiastical in origin, was more about secular than religious celebration. New terms for law courts and universities began at that time, and so were called (and still are) Michaelmas term. Let’s deal with the religious angle first, then move to the secular. Michael is an archangel in Jewish, Christian, and Islamic teachings. 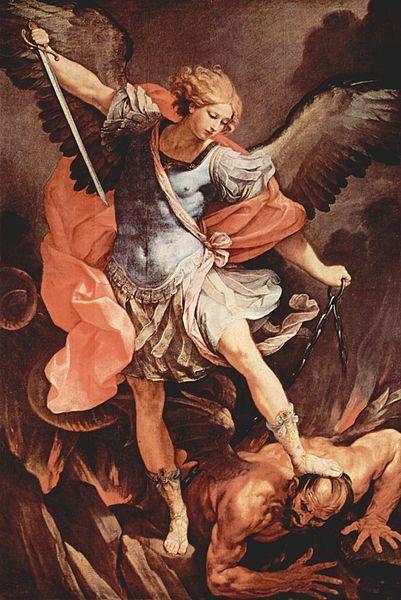 Many Christian denominations refer to him as “Saint Michael the Archangel” or simply “Saint Michael.” The theology is a bit confusing to me; I thought only humans could be saints. The term appears to be an honorific since he was never, nor could be, canonized. In Hebrew, Michael means “who is like God?” Michael is mentioned three times in the book of Daniel, once as a “great prince who stands up for the children of your people.” The idea that Michael was the advocate of the Jews became so prevalent that in spite of the rabbinical prohibition against appealing to angels as intermediaries between God and his people, Michael came to occupy a place in the Jewish liturgy. In the Greek scriptures Michael leads God’s armies against Satan’s forces in the Book of Revelation, where during the war in heaven he defeats Satan. In the Epistle of Jude , Michael is specifically referred to as an “archangel.” Christian sanctuaries to Michael appeared in the 4th century, when he was first seen as a healing angel, and then over time as a protector and the leader of the army of God against the forces of evil. By the 6th century, devotions to Archangel Michael were widespread both in the Eastern and Western Churches. Over time, teachings on Michael began to vary quite widely among Christian denominations. Both Jehovah’s Witnesses and Seventh Day Adventists, for example, treat Michael as identical with Christ in heaven, whereas Mormons equate him with Adam. 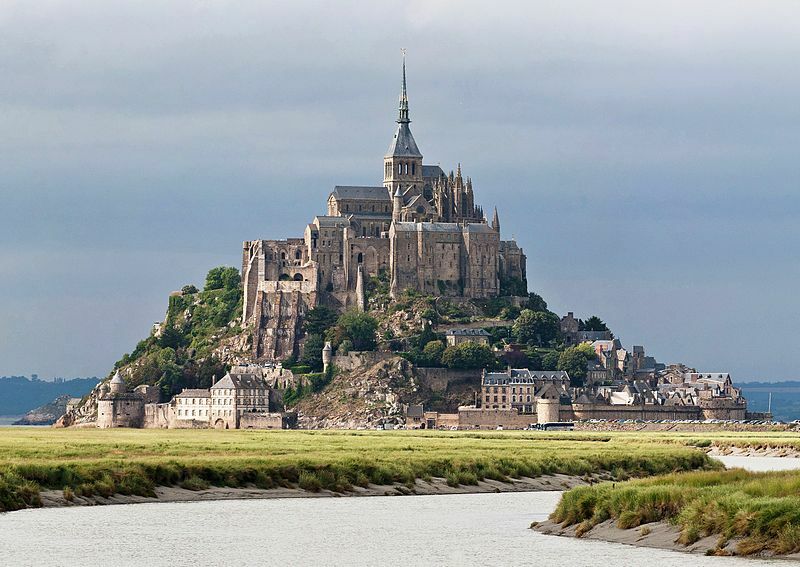 Numerous cathedrals and churches are named for St Michael and he is celebrated in countless works of art. In Bach’s time, the feast of Michael and all the angels was celebrated with a festive service, for which Bach composed several cantatas, for example the chorale cantata Herr Gott, dich loben alle wir (1724). According to an old legend in the British Isles, blackberries should not be picked after Michaelmas. This is because, so folklore goes, Satan was banished from Heaven on this day (thrown out by Michael), and fell into a blackberry bush, cursing the brambles as he fell into them. In Yorkshire, it is said that the devil spat on them when he landed. In Cornwall, a similar legend prevails, however, the saying goes that the devil urinated on them. Whatever the case, it is considered bad luck to eat blackberries after Michaelmas, so it was common to make blackberry pies and preserves on that day. The Feast of SS. Simon and Jude is 28 October. 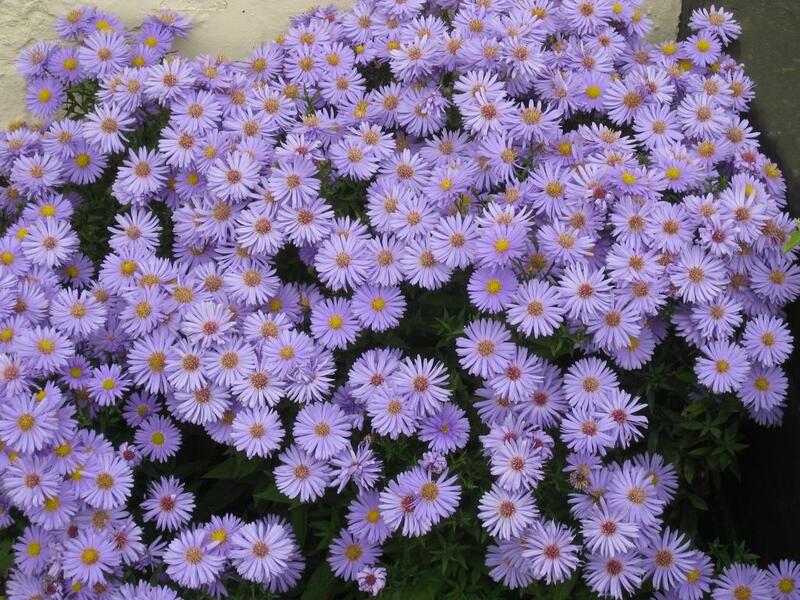 According to folklore, the practice of a girl plucking petals from a flower one at time while reciting “he loves me, he loves me not” began with Michaelmas daisies on Michaelmas. Michaelmas was conventionally celebrated in rural homes throughout the British Isles with a Michaelmas goose, usually with apple sauce because this was apple picking season. Sometimes also blackberries would be served in some form as a dessert because of the legend of Satan falling in the brambles. So I am going to give you my recipe for Michaelmas goose, and some directions for an apple and blackberry crumble. Goose was the preferred bird for this festival because they were plentiful and fat at this time of year. They would be hatched in spring, mature over the summer, and then be set out to fatten on grain fields after the harvest. Nowadays a festive goose can be hard to come by in Britain and the U.S. The turkey has replaced it as holiday poultry, for good reason. There is not a lot of meat on a goose. It has a big frame, but is mostly hollow, and the breast meat is usually quite thin. It is a very fatty bird as well, so a lot of the uncooked weight melts out in cooking. Here are my directions, based on over 30 years of experience, on how to roast a goose perfectly. Normally geese are sold frozen because there is not enough turnover to sell them fresh. You also get little choice in size. Most that I have bought over the years run around 8 lbs. If you thaw a bird that size in the refrigerator (which is preferable) it will take about 2 days depending on the temperature of the refrigerator; half that time at room temperature. Once it is thawed remove it from its wrapper and pat it dry all over with paper towels. Then leave it to air dry before roasting. Preheat the oven to at least 450°F/230°C. Here to me is the entire secret of all great roasting. Almost every cookbook will tell you to roast poultry at a high temperature for 20 minutes or so, and then turn the oven down. DO NOT DO THIS. Roast the goose at the high temperature the whole time. I learned this from an invaluable book The Complete Chicken: A Special Cookbook for Cooking Chicken by Carl Jerome. Jerome argues that in the days before people had their own ovens they would take their roasts to the local baker to cook. These ovens were lined with firebricks which every day were heated to very high temperatures (well above 500°F/260°C) with large wood fires. There was no thermostat. Therefore a goose taken to one of these bakers would roast at a very high temperature all the way through the cooking process. The results of cooking at high temperature are superb. A chicken cooked this way has wafer thin, crisp skin and juicy meat. A goose done the same way is delectable. The only drawback is that fat from roasting spits a great deal, so you can get some smoke in the kitchen. You need a good extractor fan and/or good ventilation. Everyone in the house knows when I am roasting. Place the goose on a rack in a large roasting pan big enough to accommodate the bird so that none of it overlaps the sides. Do not place it directly on the bottom of the pan because a lot of fat collects and the goose bottom will end up frying. With a fork, prick the skin of the goose all over, breast and legs. Prick the skin all the way through, and really go to town. Then place the pan in the center of the oven. Check every 15 minutes. You will notice fat starting to ooze out of the bird almost immediately. Make sure when you check the goose to turn it in the oven so that it browns evenly. If the fat is accumulating too much, drain it off with a turkey baster, and keep it in a heatproof container. Also prick the skin a little each time you look in order to ensure that the fat continues to drain. There is no need to baste the goose; the fat seeping over the skin does it for you. After an hour or so you will see that the skin has browned nicely (and is becoming crisp), and the fat is not rendering from under the skin so much, even when you prick it. When the fat has almost ceased, cook for another 10 minutes and then remove the pan from the oven. Cover the bird very lightly with a tent of aluminum foil and let it rest for 15 minutes. It is then ready to carve. Make sure you keep all of the fat which has 100 uses . From an 8 lb goose you may get 3 or 4 cups. I don’t like to stuff a goose for a couple of reasons. First, a stuffed bird takes considerably longer to cook and undermines the value of high heat roasting. Without a stuffing the goose cooks from the inside as well as the outside, and it is the short cooking at high heat that avoids the meat drying out. I know it sounds all wrong, but it works. Low heat, slow cooking dries the meat. Second, because a goose is so fatty, any stuffing becomes sodden with fat, which I find unappetizing. However, I do like a nice sage and onion stuffing so I prepare it as I would for a chicken but in a separate casserole wrapped in foil with a little air hole at the top. It only needs 30 minutes at most a high temperature. When you put it in to bake you can squirt a little goose fat through the air hole to simulate roasting inside the bird if you like. I always serve goose with crisply roasted potatoes. High heat works well for them too. I use a separate pan for them on the top rack of the oven, with the potatoes basted from the start with goose fat. Depending on size they need only about 45 minutes to be brown and crisp on the outside and fluffy on the inside. (Maybe someone who has had mine will post a comment confirming that my “roasties” were always a hit). I also serve red cabbage and apples poached in slightly acidulated water (using vinegar or lemon juice). All are perfectly seasonal for Michaelmas. I usually make a gravy from the giblets (minus the liver) which I poach in chicken stock with onions and fresh parsley whilst the goose is roasting. I then chop all the giblets very fine and thicken the stock with a dark roux. I roast the liver for about 20 minutes in the bird’s cavity. Usually it does not make it to the table — cook’s treat. If goose is the only meat for the meal, an 8lb goose will serve no more than 6. My basic recipe for plain apple crumble can be found in my post on Samuel Johnson if you click here. 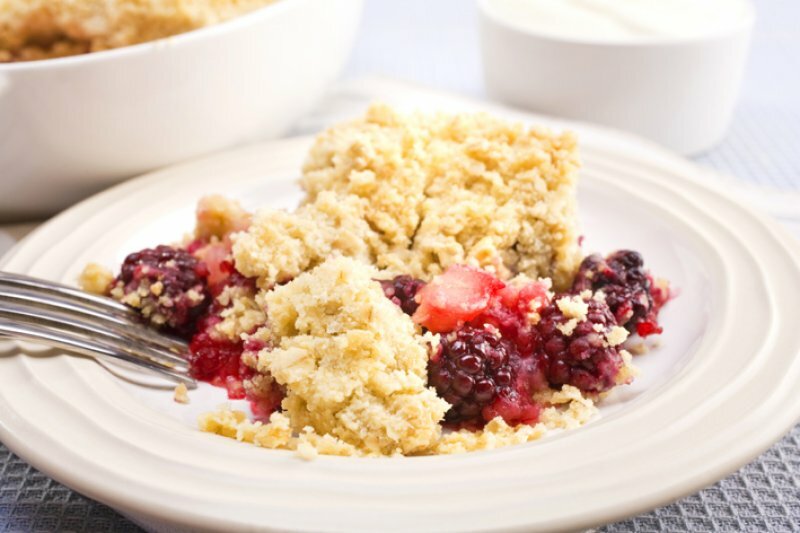 You could, in theory, make a plain blackberry crumble, replacing the apples with berries. But I find that without another fruit the blackberries tend to give up too much liquid too quickly while the crumble topping is baking and so become mushy. Therefore I go for a mix of 50-50 apples and blackberries. Otherwise the preparation is the same as for plain apple crumble.